O Mile-Ex is the result of the fusion of two industrial buildings that together span more than 370,000 square feet, a place that encourages talents to converge and companies to flourish. Located in the heart of the trendy and eclectic Mile-Ex and close to Little-Italy, O Mile-Ex offers a lifestyle that connects the business world with that of culture, entertainment and well-being. O Mile-Ex&apos;s story began in the 1960s with the creation of Tricots Main Inc. This former textile factory occupied the building for nearly 50 years and contributed to the economic boom of the Marconi-Alexandra district, better known today as Mile-Ex. The two buildings still bear the marks of their industrial past. O Mile-Ex was conceived with the aim of extending the history of these buildings and giving them a second lease on life. Offering open, bright, affordable and easy-to-access loft-style office spaces, O Mile-Ex is not only a place where it is pleasant to work. It&apos;s also an inspirational place where entertainment, relaxation and enjoyment are considered fundamental. The spaces have been designed to make everyday life both interesting and stimulating. Whether it&apos;s to take a break between two projects or after a meeting or a brainstorming session, O Mile-Ex offers many opportunities for regaining vitality and vim: sitting at the café-terrace, indulging in a gastronomic break, visiting the sports gym, taking a stroll in the adjoining park or a contemplative walk around the neighbourhood…in short, myriad sources of inspiration to feed creative minds. 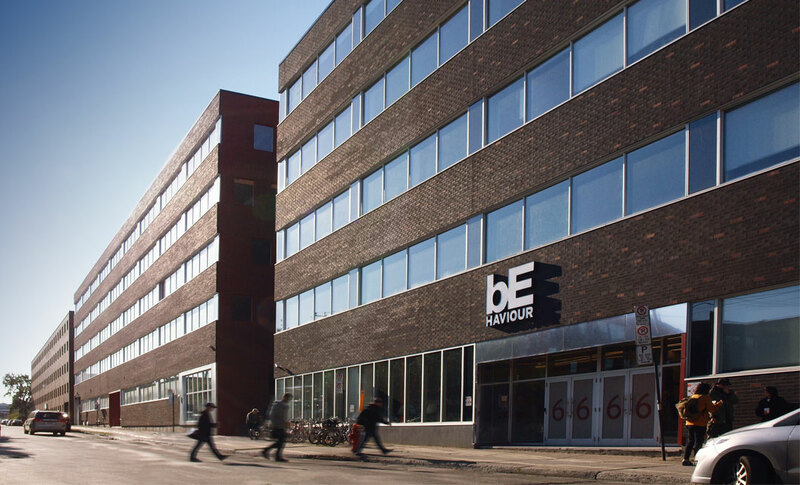 The renovation of the buildings was conceived with a focus on opening them up to the surrounding neighbourhoods in order to draw from them, and inject them, with energy, vitality and cultural effervescence. Connected by a walkway, the two buildings encourage audacious and stimulating interactions, as well as the flow of discussion and collaboration. Mile-Ex and Little-Italy together form an exceptional basin dotted with bars, restaurants, green spaces, and the quintessential Jean-Talon market. These neighbourhoods continue to evolve and gain in attractiveness thanks to the creative initiatives of their communities. O Mile-Ex wants to actively participate in this vitality. An architectural design in tune with its environment and its origins. Originally, the project sprang from a desire to respect the industrial character of the two buildings. With stunning views of the city and of Mount Royal, the office spaces have retained the original character of the buildings. Exposed ceilings, rough finishing, cement floors and natural light all contribute to the elegance of these unique lofts. The industrial and ultramodern styles work in harmony thanks to renovation efforts inspired by the original architectural complex, such as the fenestration and the masonry, as well as the electrical and mechanical systems. TOTAL SURFACE AREA OF THE BUILDING : 370,920 SQ. FT. SURFACE AREA PER FLOOR : 33,469 TO 40,715 SQ. FT.
Serenity, warmth and cultural effervescence. Where well-being and innovation merge. 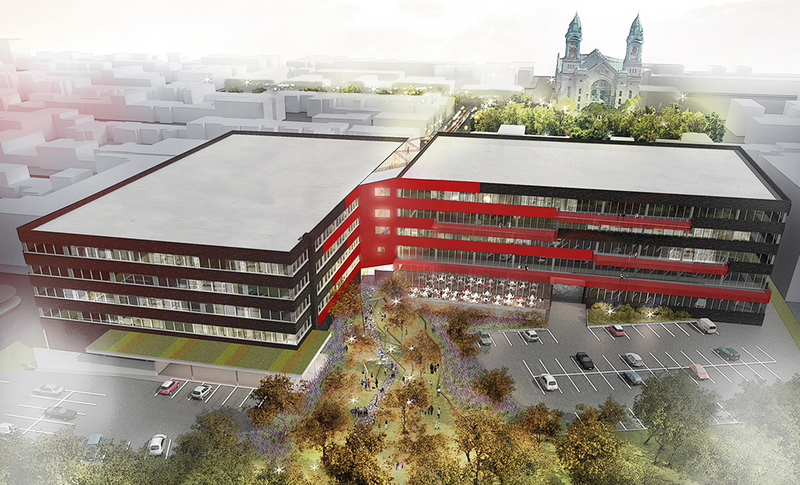 O Mile-Ex was conceived and designed with the idea that a location influences creativity and results. A pleasant and dynamic environmentinduces a good mood and the desire to create and innovate. 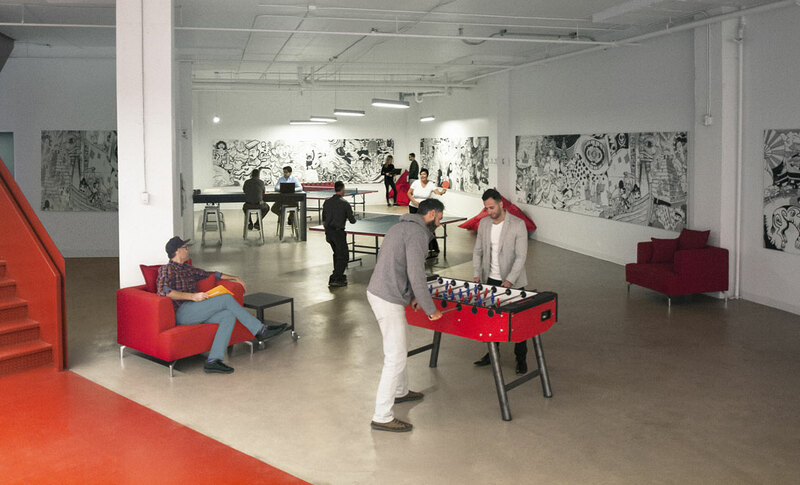 O Mile-Ex offers an out-of-the-ordinary work environment adjacent to Petite Patrie park and the future linear park. During summer, the back lane and lot of the building are transformed into relaxing meeting spaces. 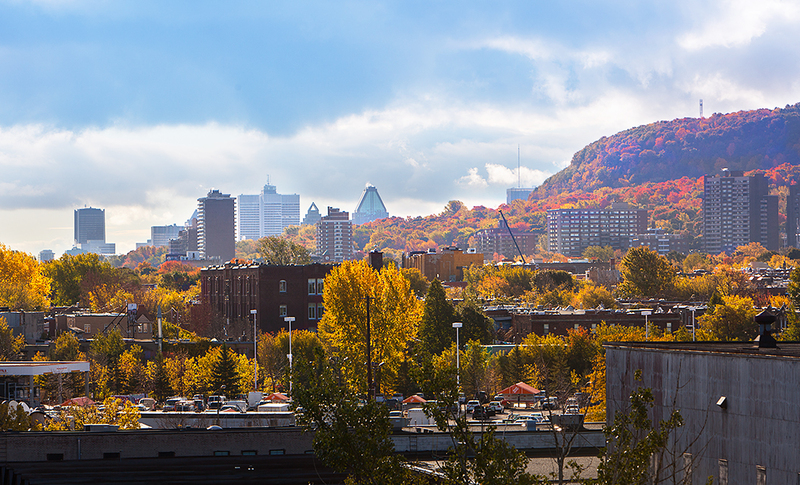 Situated near the future Outremont Campus of the University of Montreal, O Mile-Ex has taken root in an areawhere innovation predominates. Accessibility is always an important factor and can be one of the top reasons we like working where we do. O Mile-Ex is fully serviced by bus and metro lines, as well as commuter trains. A parking lot is dedicated to employees, who can, as needed, get downtown in ten minutes or access the nearby major highways. Avid cyclists will be delighted to discover the bike paths and the BIXI station at O Mile-Ex’s front door.